Welcome to my website! I’m Joe, and I build every Dragony guitar by hand in my Northern California shop. My focus is on the guitar as a tool. Playability and tone are my primary goals. I’m a straightforward guy, so my instruments tend to be fairly plain and unadorned — and they sound terrific. If you need a great sounding and playing instrument at a reasonable price point, I believe you’ve found what you’re looking for. If you like what you see here, call or drop me a line. “In 1998 I started searching for a D’Angelico arch top guitar, Gibson Super 400 or L5 to add to my vintage guitar collection. After years of searching and being unable to find a good performance guitar, I heard one of Joe Dragony’s arch top instruments at a live performance. Soon after, I met with Joe and abandoned my search! Joe listened to what my needs and desires were for a guitar; an instrument with a rich, warm sound that also had “bite”, good sustain when needed and a guitar that could “sing”. The primary use of this guitar would be for jazz and rhythm & blues. He brought several blocks of wood for me to look at and he educated me on the qualities of each type of wood regarding sound. We settled on the materials and he reviewed the type of neck and action that I sought. He went through my existing guitars, took measurements and asked me how I would like to improve the action and feel. Joe wanted to create the “ideal” neck for me. The guitar was completed in 2000 and it has replaced all of my other guitars for both live performance and studio work. It is exactly what I had been looking for and far exceeded my expectations. The quality of sound is impeccable and the reliability of the instrument is flawless in every aspect; the intonation is absolutely perfect and consistent in every position. The guitar has a rich, warm sound with the “bite” that I had heard in my mind for many years. This guitar absolutely “sings”. I highly recommend Dragony Guitars to any artist looking for the best quality instrument available for live performance as well as studio work. The workmanship is second to none and the Dragony Guitar is an absolute work of art. For any musician that has a “stable” of guitars, be advised that once you invest in and acquire a Dragony Guitar you probably will retire all of your other instruments. It’s simply that good! 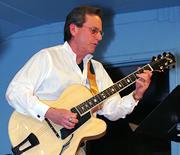 *Ralph Hammer is a graduate of Berklee College of Music and has performed in concert and recorded with Stevie Wonder, Joe Cocker, Ray Charles, Etta James and many other artists. 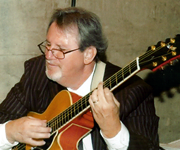 He has been a studio guitarist for Motown Records, Capitol Records and Columbia Records. He currently performs with Blue Rhythm. 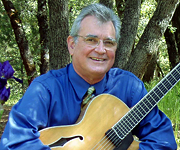 “My Dragony Performer 17” archtop guitar is an instrument I treasure more the longer I have it. Over the 11 years, hundreds of gigs, hours of practicing and teaching since I purchased it, I am still amazed at the beautiful tone, balance, playability and durability of this instrument. And, it has improved with age. 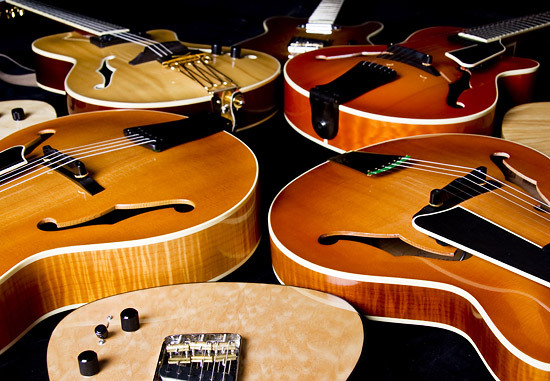 “Hand made Joe Dragony guitars are simply the best in sound quality that you will find anywhere, anytime, period. Besides the wonderfully warm and natural acoustical properties, the thing that really stands out is the feel of the neck and fingerboard. The playability is exquisite. The body and overall weight is light and very comfortable to play. My guitar is as good if not better than any classic Gibson, Guild, Epiphone, or any of the other guitars that I’ve owned in thirty plus years of playing and recording. I’ve played that guitar on a number of studio and live jazz recording sessions, and fellow musicians as well as producers and engineers always comment on the beautiful sound — which really comes from the guitar itself and in turn translates its beautiful and natural acoustical quality through the pickup into the amplifier or straight through the recording board. I’ve even played through P.A. systems with excellent results. 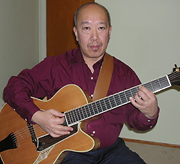 “I have played Joe’s guitars now for two years, and I am ready to order another one! I figure more people have now heard and played his instruments, so with increasing demand the order time and price are going to have to go up! If I wait, I will wind up paying the price of the top line name custom luthiers, because that’s exactly what Joe is. Joe was initially recommended to me for guitar repair. I had him do a set up on my 25-year-old ES 335 copy, and he drastically improved its playability. “This guitar has it all: sound, feel, balance, playability, craftsmanship, beauty, and most of all, a great vibe. 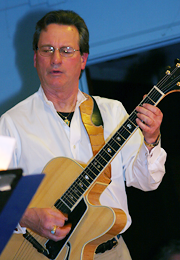 Joe’s guitar has a lively resonance, with an acoustic sound that is loud, clear and balanced with warmth. The box has a sound which naturally reverberates within itself. I was pleasantly surprised when I first heard this characteristic — it’s like having natural reverb without an amp. I love playing this guitar without an amp — and when I do plug in, it sounds great too. For such a lively guitar, it holds up well to loud volumes without uncontrollable feedback. The guitar is light, comfortable, and balanced, and sounds as beautiful as it looks. The neck is perfect. I can dig in and still get a nice clean sound. You should see the curves and highly figured woods on this baby. The quilted maple is stunning. It’s a fine instrument. I get a lot of compliments on the sound and looks of the guitar. It’s a great pleasure to play and own one of Joe’s guitars.